The Word of God on Faith, Hope and Charity. Chicago, Illinois. : Henry Regnery Company.. Good with no dust jacket. 1963. Hardcover. 8vo - 20.5 x 13.5 cm. ; (6) - 113 pp. 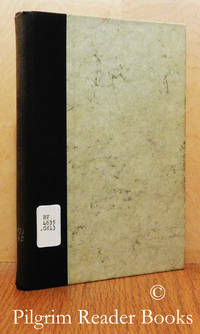 Marbled paper (pale green and gray) over boards with black cloth and gilt lettering (very faded) on the spine. Translated from the German, "Drei Schriftauslegungen", by Stella Lange. Guardini considers Faith (the word of God) from the prologue of the gospel of John, Hope (the yearning of creation) from Romans, chapter 8 and Charity (the canticle of love) from First Corinthians, chapter 13. 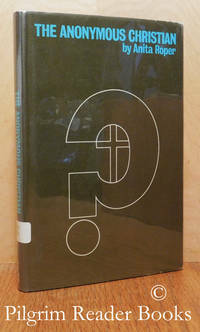 The dust jacket flaps are pasted onto the front end papers and from them: "Guardini's contribution to Christian letters is almost a unique phenomenon of our age, for even the more controversial aspects of what he speaks or what he writes are respected for their substance and importance." The library markings are a label on the lower spine corner of the front board, a stamp on the title page and attachemnts on the back end papers. Previous owner's name crossed out on the title page. Otherwise clean with a sound binding and showing only mild wear to the externals with the exception of the sunned and faded spine. Worth reading? Yes, and more than once. A clear and removable archival cover has been fitted. .
New York. : Sheed and Ward.. Good in Good dust jacket. 1966. Hard Cover. 8vo - 21 x 14 cm. ; xii - 179 pp. Light blue cloth over boards with black lettering on the spine. Translated from German, "Die Anonymen Christen", by Joseph Donceel, SJ. With an afterword, "The Anonymous Christian According to Karl Rahner" by Klaus Riesenhuber, SJ. Eight pages of notes. 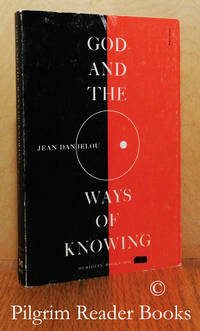 From the dust jacket: ". . . (Roper's) . 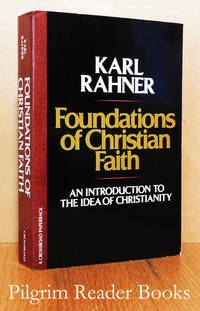 . . book is in fact an original, clear and persuasive presentation of some of the profound themes of Rahner's theology." Usual library markings and with a previous owner's name crossed out on the front free end paper. The dust jacket is in a library applied archival cover and fastened to the paste down end papers. Otherwise the book shows only minor wear and is clean with a sound binding. .
New York. : Paulist Press.. Very Good. 1969. Soft Cover. 12mo - 18 x 10.5 cm. ; vii - 114 pp. Translated from the German edition, "Glaubst du an Gott? ", by Richard Strachan. Nine essays by Rahner as follows: I - "Can We Still Believe", II - "The Believer amid Unbelievers", III - "Intellectual Honesty and Faith", IV - "Is Faith Possible in Today's World Picture? ", V - "Science and Faith", VI - "Is Faith an Ideology? ", VII - "Healing and Salvation through Faith", VIII - "Faith Today" and lastly, IX - "Can God Be Experienced?". Previous owner's address label on the on the first page, otherwise clean with a sound binding and showing mild edge wear and light scuffing to the covers. .
Ramsey, New Jersey. : Paulist Press.. Very Good. 1983. Soft Cover. 0809125595 . 8vo - 20 x 13.5 cm. ; xiii - 154 pp. 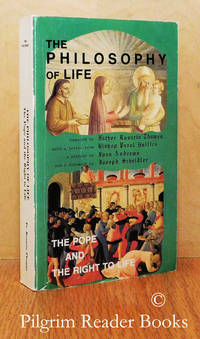 Five page inroduction by Avery Dulles SJ and from that introduction: ". . . Particularly valuable, in my opnion, are the sections of the book in which, with the help of St. John of the Cross, it treats of contemplative prayer, and those is which, with the help of Karl Rahner, it takes up the question of discernment of spirits in the decision making process." Nineteen pages of notes. The library markings, none of which are external, are a stamp on the title page and attachments on the inside of the back cover. Otherwise very clean with a sound binding and showing only minor wear to the covers. .
By Reason Alone: Assembling the Great Puzzle. Ottawa, Ontario. : Justin Press.. Near Fine. 2010. Softcover. 9780981318448 . 8vo - 21 x 13.5 cm. ; 255 pp. Twelve pages of references and suggested reading. From the author's preface: "A friend of mine asked me why I have written this book. I responded that I have written the kind of book I wish I had read at age 25." Minor edge wear and light scuffing to the covers, else fine. .
God and the Ways of Knowing. Cleveland, Ohio. : The World Publishing Company / Meridian Books.. Good. 1967. Soft Cover. 8vo - 20 x 13 cm. ; 249 pp. Translated from the original French edition, "Dieu et Nous" by Walter Roberts and this is the ninth Meridian Books soft cover printing. Short bibliographies at the end of each of the 6 chapters and 7 pages of author's notes at the back. Moderate wear and scuffing to the covers and the head margin of the first page is clipped. Otherwise clean with a sound binding. 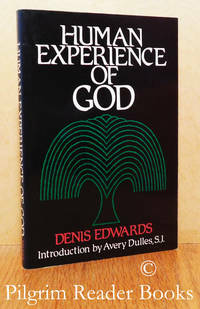 From the author's preface: "My plan in this book is not to record what I say of God, but what God has said of Himself . . . to place religions and philosophies, the Old Testament and the New, theology and mysticism, in their proper relationship with the knowledge of God." . The Philosophy Of Life: The Pope And The Right To Life. By Thomas, Fr. Rosario. (editor). Cochiti Lake, New Mexico. : Pro Fratribus Press.. Good. 1989. Softcover. 12mo - 18 x 10.5 cm; lxxxiii - 276 pp. With a letter from Bishop Pavol Hnilica, a preface by Joan Andrews and a foreword by Joseph Scheidler. A look at 'life' issues referenced to Vatican documents. The library markings, none of which are external, are a stamp on the title page and attachments on the inside of the back cover. Minor wear to the covers and the beginning of a reading crease in the spine. 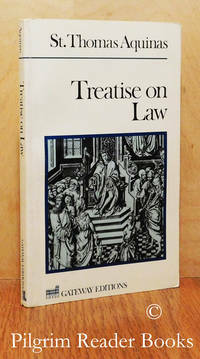 Otherwise clean with a sound binding. .
Treatise on Law: Summa Theologica, Questions 90-97. Chicago, Illinois. : Regnery Gateway Edition.. Very Good. Soft Cover. 089526918X . 12mo - 17.5 x 11 cm. ; xi - 116 pp. Seven page introduction by Stanley Parry. The library markings, none of which are external, are a stamp on the title page and attachments on the inside o the back cover. Otherwise clean with a sound bibding and showing only minor wear to the covers. .
God's Spirit in the World: Ecumenical and Cultural Essays. (Christian Philosophical Studies II). Washington, DC. : The Council for Research in Values and Philosophy.. Very Good. 2012. Soft Cover. 9781565182738 . 8vo - 23 x 15 cm. ; vii - 195 pp. This is volume 43 in "Series IVA: Eastern and Central European Philosophical Studies" and also volume 2 in "Series VIII: Christian Philosophical Studies" from this publisher under the more general series name "Cultural Heritage and Contemporary Change" and the general editor being George F. McLean. Fr. 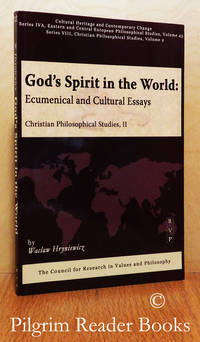 Hryniewicz was a professor at the Catholic University of Lublin in Poland and a director of the Ecumenical Institute there. 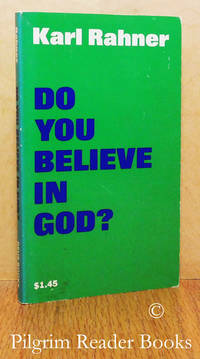 The essays in this collection all deal with the Holy Spirit and charisms. Five page curriculum vitae of Fr. Hryniewicz and a four page general index at the back along with a fourteen page list of other publications from this publisher. One entry in this last list is highlighted in yellow and one line from Fr. Hryniewicz's CV is highlighted the same. Otherwise very clean with a sound binding and showing only a whisper of wear to the cover edges. .
New York. : Herder and Herder.. Very Good in Good dust jacket. 1970. Hardcover. 8vo - 20.5 x 13.5 cm. ; 120 pp. Gray cloth over boards with black lettering on the spine. Translated from the 1967 German edition, "Mysterium Salutis, Grundriss heilsgeschichtlicher Dogmatik", by Joseph Donceel and edited by Johannes Feier, Magnus Löhrer and Thomas F. O'Mara. Footnotes throughout. The library markings are a label ghost on the lower spine and the library name stamped on the front free end paper. Otherwise clean with a sound binding and showing mild wear to the spine tips. The dust jacket hs a paper label taped to the lower spine and general though mild wear to the edges. .
New York. : Newman Press.. Very Good in Good dust jacket. 1969. Hardcover. 8vo - 21 x 13.5 cm. ; vii - 114 pp. Blue coth over boards with gilt lettering on the spine. Translated from the German edition, "Glaubst du an Gott? ", by Richard Strachan. Nine essays by Rahner: I - "Can We Still Believe", II - "The Believer amid Unbelievers", III - "Intellectual Honesty and Faith", IV - "Is Faith Possible in Today's World Picture? ", V - "Science and Faith", VI - "Is Faith an Ideology? ", VII - "Healing and Salvation through Faith", VIII - "Faith Today" and lastly, IX - "Can God Be Experienced?". The library markings, none of which are external, are a stamp on the title page and attachments on the back end papers. Previous onwer's name on the front free end paper, otherwise clean with a sound binding and showing very little wear to the externals. The dust jacket has mild wear to the edges and the spine is a tad faded. .
Theology and the University: An Ecumenical Investigation. Baltimore, Maryland / London, UK. : Helicon Press / Darton, Longman & Todd.. Good with no dust jacket. 1964. Hardcover. 8vo - 21.5 x 14 cm. ; x - 286 pp. Gray cloth over boards with gilt lettering on the spine. Papers from a symposium held at Downside Abbey and presented here under the following headings: I - "Theology and the University" (introduction), II - "An Educated Laity; Problems and Opportunities (4 articles plus responses), III - "Theology - Its Nature and Practice" (1 article), IV - "The Creative Centre: Exercises in Open Dialogue" (2 articles plus responses), V - "Needs and Proposals" (2 articles plus response). Six page general index at the back. The library markings, none of which are external, are a stamp on the title page and attachments on the back end papers. Previous owner's name on the front free end paper. Minor wear to the spine tips and the fore corners of the boards and the cloth is faded on the spine and the head margins of the boards. 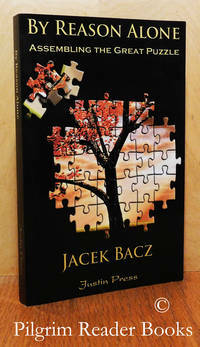 Otherwise clean with a sound binding. .
Impact of History on Theology: Thoughts of a Czech Pastor. Notre Dame, Indiana. : Fides Publishing.. Very Good. 1970. Softcover. 8vo - 21.5 x 13.5 cm. ; vi - 117 pp. Translated from the Czech by Monika and Benjamin Page though first published in French as "Pour quoi je vis". Hromadka (d. 1969) was a professor of theology in the University of Prague, president of the Christian Peace Conference, friend of Thomas Masaryk. Two page bibliography of Hromadka's works. 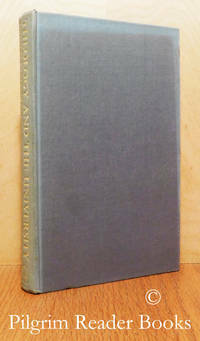 Mild wear to the fore corners of the covers and the spine is a tad darkened or sunned. 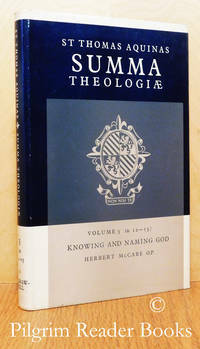 Otherwise the book is clean with a tight binding and appears to have been used very little if at all. .
Summa Theologiae: Volume 3, Knowing and Naming God. (1a. 12-13). London, UK. / New York. : Blackfriars / McGraw-Hill.. Very Good in Very Good dust jacket. 1964. Hardcover. 8vo - 21.5 x 14 cm. ; xl - 117 pp. Blue cloth over boards with gilt lettering on the spine and a gilt crest centered on the front board. One page general preface by Thomas Gilby OP. The text is printed with the Latin on the verso and the English translation on the recto. Translated by Herbert McCabe OP and with 2 pages of editorial notes, a 22 page introduction, 4 appendices, a 4 page glossary of technical terms and a 5 page index. Footnotes throughout. The library markings are a stamp on the title page, a faint stamp on the text block fore edge and attachments on the back free end paper. Previous owner's name crossed out on the half title page. Otherwise clean with very mild wear. The dust jacket has mild wear to the edges. .
Summa Theologiae: Volume 21, Fear and Anger. (1a2ae. 40-48). London, UK. / New York. : Blackfriars / McGraw-Hill.. Very Good in Very Good dust jacket. 1965. Hardcover. 8vo - 21.5 x 14 cm. ; xxv - 193 pp. Green cloth over boards with gilt lettering on the spine and a gilt crest centered on the front board. One page general preface by Thomas Gilby OP and T. C. O'Brien OP. The text is printed with the Latin on the verso and the English translation on the recto. Translated by John Patrick Reid OP and with 3 pages of editorial notes, a 6 page introduction, 7 appendices, a 5 page glossary of technical terms and a 3 page index. Footnotes throughout. The library markings are a stamp on the title page, a faint stamp on the text block fore edge and attachments on the back free end paper. Previous owner's name crossed out on the half title page. Otherwise clean with very mild wear. 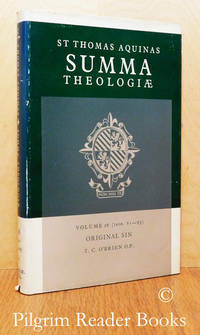 The dust jacket has mild wear to the edges and the spine is a tad faded. .
Summa Theologiae: Volume 26, Original Sin. (1a2ae. 81-85). London, UK. / New York. : Blackfriars / McGraw-Hill.. Very Good in Very Good dust jacket. 1965. Hardcover. 8vo - 21.5 x 14 cm. ; xxiii - 178 pp. Green cloth over boards with gilt lettering on the spine and a gilt crest centered on the front board. One page general preface by Thomas Gilby OP and T. C. O'Brien OP. The text is printed with the Latin on the verso and the English translation on the recto. Translated by T. C. O'Brien OP and with 2 pages of editorial notes, a 5 page introduction, 9 appendices, an 8 page glossary of technical terms and a 8 page index. Footnotes throughout. The library markings are a stamp on the title page, a faint stamp on the text block fore edge and attachments on the back free end paper. Previous owner's name crossed out on the title page. Otherwise clean with very mild wear. 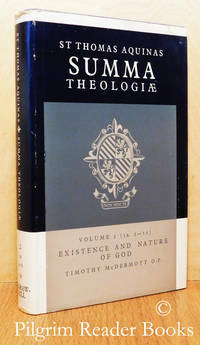 The dust jacket has mild wear to the edges and the spine is a tad faded. .
Summa Theologiae: Volume 2, Existence and Nature of God. (1a. 2-11). London, UK. / New York. : Blackfriars / McGraw-Hill.. Very Good in Very Good dust jacket. 1964. Hardcover. 8vo - 21.5 x 14 cm. ; xxvii - 239 pp. Blue cloth over boards with gilt lettering on the spine and a gilt crest centered on the front board. The text block head edge is stained blue as issued. One page general preface by Thomas Gilby OP. The text is printed with the Latin on the verso and the English translation on the recto. Translated by Timothy McDermott OP and with 3 pages of editorial notes, an 8 page introduction, 16 appendices, a 5 page glossary of technical terms and a 5 page index. Footnotes throughout. The library markings are a stamp on the title page, a faint stamp on the text block fore edge and attachments on the back free end paper. Previous owner's name crossed out on the title page, faint tide mark (dampstain) on the top fore edge corners of the text block. Otherwise clean with very mild wear. The dust jacket has mild wear to the edges. .
Opera Omnia Quae Exstant. Tomi Secundi, Pars Prior. By Saint John Chrysostom. (Joannis Chrysostomi). Paris, France. 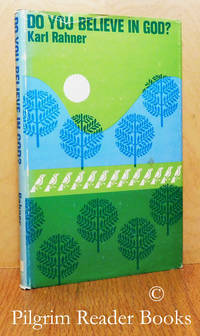 : J. P. Migne.. Fair with no dust jacket. 1862. Hardcover. 4to - 26.5 x 17.5 cm. ; 417 pp. Black cloth over boards with gilt lettering on the spine. A mostly bilingual text in Latin and Greek printed two columns per page. Usual library markings. The text is clean while the binding is shaken with several splits exposing the mull cloth. . The Meaning of Christian Perfection. By Aumann OP., Jordan and David L. Greenstock. London, UK. : Blackfriars Publications. Good in Good dust jacket. 1956. Hardcover. 8vo - 21.5 x 13.5 cm. ; 162 pp. Black cloth over boards with gilt letterinbg on the spine. Fr. 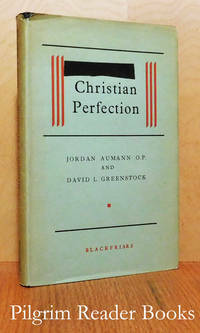 Greenstock's doctoral dissertation was published in an adapted form as "Be Ye Perfect" in 1952. Its publication sparked a series of letters between him and Fr. 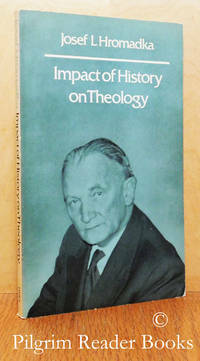 Aumann who took issue with his lack of an attempt to reconcile the disparate schools of spiritual theology. The letters, with a decidedly Thomistic tone, are here collected and presented in their chronological sequence. The library markings are the usual with none being external. The end papers show some foxing as do the text bock edges. 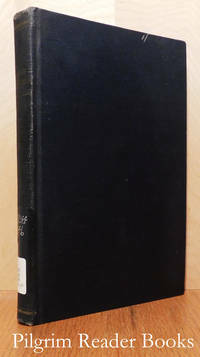 The dust jacket has mild to moderate edge wear and the first part of the title (the words "The Meaning of ") have been blacked out on the front of the jacket. . Foundations of Christian Faith; An Introduction to the Idea of Christianity . New York. : Crossroad.. Very Good+. 1993. Softcover. 0824505239 . 8vo - 23 x 15.5 cm. ; xv - 470 pp. 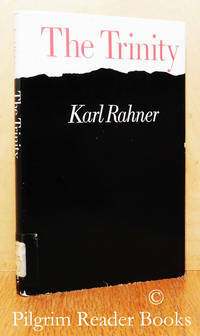 First published in this translation in 1978, this is a later printing of the soft cover edition. Translated from the original 1976 German "Grundkurs des Glaubens: Einfuhrung in den Begriff des Christentums" by William V. Dych. Rahner describes this book as being written for the educated reader who is not afraid to wrestle with an idea and also hopes that his readers will not find it too primitive or too advanced. Rather than an index, a detailed table of contents of 10 pages is provided at the back indicating that the book is to be used as a continuum and not so much as a scholarly reference work. Previous owner's book plate on the first (half-title) page. The book is otherwise very clean and tight showing only some quite mild shelf wear to the fore corners of the covers and the spine head. .